Image Size (H x W): 20" x 28"
Medium:Offset print on Paper. Edition of 300. Done in 2001. >Known as the Picasso of India, Maqbool Fida Husain was born in 1915 in Pandharpur in Maharashtra. He studied at Indore Art College before moving to Bombay where he went through a period of painting cinema hoardings. In 1947, he was one of the founding members of the Progressive Artists Group along with F. N. Souza, Khrishna Hawlaji Ara, Sayed Haider Raza and Sadanand K. Bakre. He participated in or has been the subject of numerous exhibitions throughout the world, including Sao Paulo Biennale in 1971, the Contemporary Indian Art exhibition at the Royal Academy, London, in 1982 and the India, Myth and Reality: Aspects of Contemporary Indian Art exhibition at the MoMA, New York, in 1982. There have been many publications on his work, notably Richard Bartholomew and Shiv Kapur’s monograph. He was also a film-maker, his popular film ‘Gaja Gamini’ with Madhuri Dixit. He was member of the Indian Parliament from 1986 to 1992. He spent his last remaining years between Dubai, Doha and London. M F Husain passed away in London in 2011. 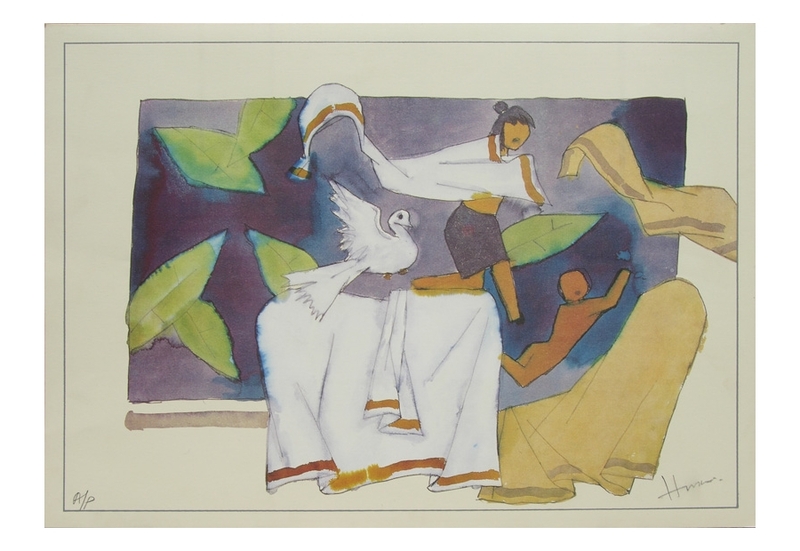 Honours and Awards 2007 Raja Ravi Varma Award, Government of Kerala. 2007 Honorary Doctorates, Benaras Hindu University (BHU), Varanasi. 2007 Honorary Doctorates, Jamia Millia Islamia University, New Delhi. 2007 Honorary Doctorates, Mysore University. 2004 Lalit Kala Ratna, Lalit Kala Akademi, New Delhi. 1997 Aditya Vikram Birla ‘Kalashikkar’ Award for Lifetime Achievement. 1991 Padma Vibhushan, Government of India. 1973 Padma Bhushan, Government of India. 1968 National Award for Best Experimental Film ‘Through the Eyes of a Painter’, India. 1967 Won the Golden Bear for his film 'Through the Eyes of a Painter', International Berlin Film Festival and purchased by Museum of Modern Art (MOMA), New York. 1966 Awarded Padmashree, Government of India. 1959 International Biennale Award, Tokyo. 1955 First Prize at the National Exhibition of Art, Lalit Kala Akademi, New Delhi. 1947 Bombay Art Society, Mumbai.